April 19, 2018 - High Dollar Centaur - My 'good' Centaur languishes in the laundry room, awaiting a fuel tank cleanup and carb rebuild - faring better than the first one I got, which sits in the corner of the TC's garage, unused for thirteen years. In the meantime, I got quite a shock today when I saw the final sale price of a nice Centaur that came on eBay. More than five thousand dollars! My centaur is actually in better shape other than the fuel tank and carb, but I did not have the factory saddlebags or rack (with the box!). Granted, this could be a fluke sale, but with 33 bids there were a surprising number of interested people. Inspiration to get both Centaurs back running again, especially the nice one. No, it is not going to be for sale, but the other might find a better place than the corner of a shed. August 13, 2016 - Sleepwalking - Another two years of almost no use had repercussions this time - I pulled the Centaur out for the 2016 Southeastern AACA Fall Meet in New Bern NC this weekend, and it did not want to wake up. I managed to get it to fire and run for a few seconds, but then it refused to do anything even with starting fluid. I suspect the points, which have not been touched since it was built 53 years ago, need attention. In addition, the pull rope did not rewind back, and I discovered it had come apart and frayed near the inner end and was hanging up on the recoil housing. Happily, I did not have to run it at the show, so I packed it up in the Crown Victoria's trunk and set it out for display. There is an old-fashioned hardware store in New Bern that had the correct cotton rope to replace the worn starter pull, and I'll clean and regap the points. She should do fine after those items are fixed. I really need to to pay more attention to the poor thing! 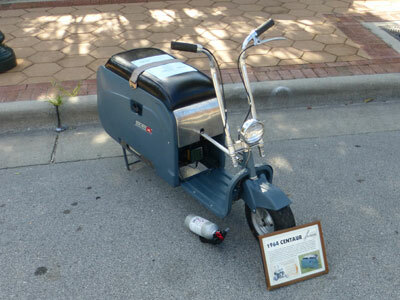 June 20, 2014 - Out of hibernation - The Centaur has been sitting untouched next to the washing machine for almost three years - word of a vintage motorcycle gathering at a nearby diner prompted me to drag her out and carry her over to participate. Unfolding the 'Samsonite suitcase' into a motor vehicle is always an attention getter. Surprisingly, the Centaur fired up and ran well once I discovered the OFF/ON tag for the ignition switch had been flipped around. One of the bikers who normally rides a vintage weekend racer Triumph took the Centaur around the parking lot for a few laps. No doubt he was awed by the throbbing power of the 5.5 HP Clinton go-cart engine. August 11, 2012 - Never too late to learn - I've been meaning to send the serial numbers for my Centaurs in to the online Centaur user's group (Centaurscooter@yahoogroups.com) for a while, and finally got out a flashlight, reading glasses, and a pencil. The older of the two is #300454 (model L4 - Centaur Division of Lombard Industries), probably built around 1962. However, the complete and original Centaur is #560917, built by Alexander Reynolds Company in Hackensack NJ! I did a bit of research tonight and discovered that Alexander Reynolds Company, also known as Arco, made minibikes up into the 1970s. My best guess is that they were the last owners of Centaur scooters. Why did they stop production? I suspect they never did produce any of their own - remember that Centaurs used really nice Clinton go-kart engines. 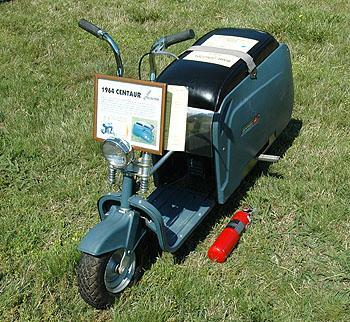 Could be that they bought out the last stock for the excess engines, relabeled the completed scooters with their own name and sold them off. We'll probably never know. On the other hand, I do know 560917 was first registered in 1967, which I always thought was an indication it sat in a showroom for years. 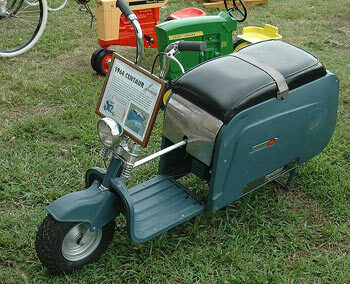 Instead, it could be the scooter was the last of its breed. October 6-8, 2011 - HERSHEY! 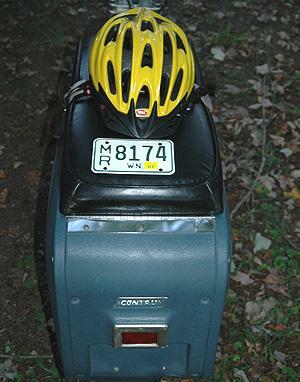 - I have never taken a vehicle to Hershey before, so I registered the Centaur. She was eager to go - I rode her onto the field between a 1966 Mustang and 1939 Cadillac, getting a lot of looks (and laughs). Same parade of kids and curious adults. The Centaur shows in HPOF class - High Percentage of Original Features, and is arguably the most original vehicle in all of AACA. The only htings ever changed are the gas and air in the tires - even the crankcase lube is sealed from the factory! However, when you see HPOF cars from the forties and fifties that look practically showroom fresh, she doesn't stand out so much! August 13, 2011 - AACA Southeastern Fall Meet (Bristol, TN) - The Centaur was one of more than 360 vehicles at the Bristol meet - as usual, it provided entertainment for many kids, and prompted a lot of adults to wonder why no one makes something like this now. I rode her around the field and had a good time. And yes, she now gets a double sheet of cardboard across the seat before she goes into the car trunk! July 31, 2011 - Back together! - I registered the Centaur for the AACA Southeastern Fall Meet in Bristol TN in a couple of weeks, and was happy to get a phone call from Paul Cho. 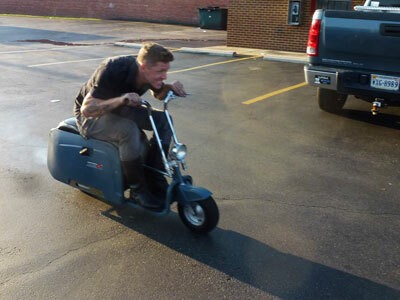 He own a custom interior shop that does stunning upholstery work for Lamborghinis, Jaguars, Mercedes, classic British cars, and... Centaur motor scooters. 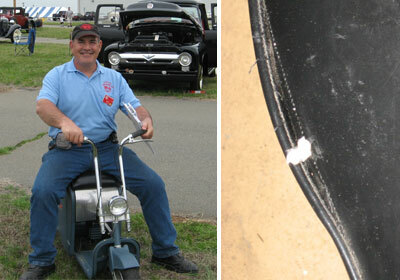 He repaired and restitched the original seat upholstery good as new! It's all back together now, and I can start getting the scooter cleaned up and ready to show at Bristol. April 9, 2011 - AACA Southeastern Spring Meet (Charlotte) - It's been 8 months since the Centaur has moved from its 'garage' next to the washing machine in the laundry room. 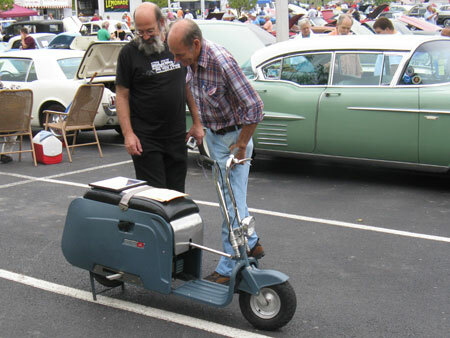 However, I wanted to register something for the Charlotte Auto Fair, and the scooter fits neatly into the trunk of the Sonata. Or maybe not so neatly. The seat caught on something and tore open the seam on the seat as pulled it out - very minor damage, at least, which I can get repaired. Amazingly, the scooter started right up and ran great. The Centaur spent the day on the show field as the most original of all the 'Historical Preservation of Original Features' vehicles. It has only had fuel and air in the tires changed since 1964 - even the engine lubricant is original. 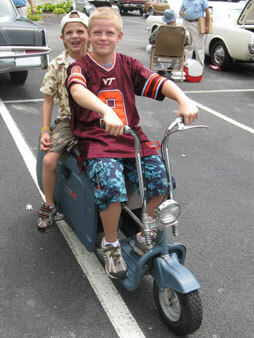 The scooter was sharply contrasted by friend Tony Scarpelli's 1964 Chrylser Imperial, also an HPOF vehicle. I zipped all over the show field (yeah, that's me on the poor Centaur), toured the swap meet, and generally had a great time. I got her all cleaned up inside and out, and will make some sort of cover to protect the seat in the future. August 15, 2010 - AACA Southeastern Fall Show (Blacksburg) - With some fuel in the tank and some air in her tires, the Centaur fired up after just a few tugs on the pull handle - not bad after sitting for two years. I always make sure to turn off the fuel and run the carb dry, which prevents old fuel gumming up the works. 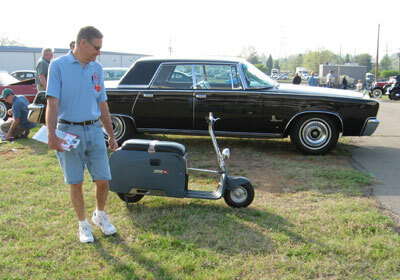 Anyway, the scooter ended up with a spot directly behind a fellow TRAACA member's 1964 Chrysler Imperial - talk about contrasts! The scooter got a lot of attention - one father brought his two boys over to let me know they had voted for it as the 'Young Person's Best in Show'. 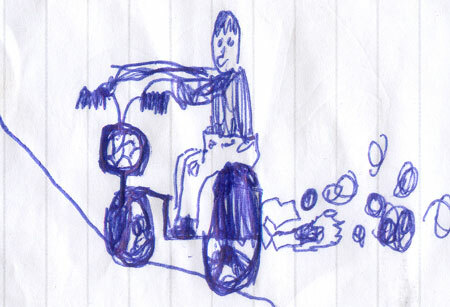 The younger of the two (wearing hat below) had drawn the most excellent picture at right - he must have seen me coming in, as the two-cycle engine does smoke. I gave them a quick demonstration of how the Centaur folds up and unpacks, and then took each for a ride around the show field (below). We all had fun! August 12, 2010 - It's been almost two years since I had the Centaur out - so I put her in the Sonata's trunk tonight and will display her at the AACA Southeastern Division Fall Meet in Blacksburg, VA this weekend. I picked up a small gas can just for the Centaur, and will get her fueled up when I get there. February 27, 2010 - Big news for Centaur owners! A company is now reproducing the plastic body parts that have been the Achilles Heel of our scooters. 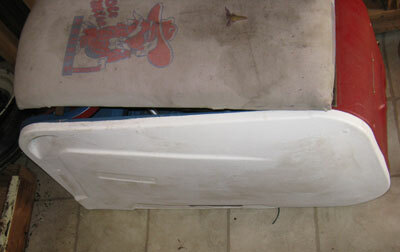 They sent me photos of the new parts, and I went ahead and ordered side panels for my second Centaur that needs them. The new parts are made of fiberglass, and need a bit of trim and fit to work right. For example, the holes for the seat strap pegs aren't there, and there is a little warpage. However, as you can see by the fit on my Centaur, the side panels look good. Just needs to have the proper holes cut and then be painted. Go to the Technical Library page for photos and more information. September 20, 2008 - After spending the past year or so wrapped up in a blanket next to the washing machine, the Centaur got a ride in the back of the Model A to our big local AACA Wings and Wheels car show. Since she already won the National-level award for High Percentage of Original Features (HPOF) she just got a preservation plaque, but it was fun riding her around the field. As usual, despite the long spell of sitting she fired right up and ran great. June 12, 2007 - Check out the new Technical Library page! Fellow Centaur owner Scott Grillo has provided yet another great resource - the Centaur Spare Parts manual! I combined the various documents we have on a new Technical Library page and will make every effort to get my Owner's Manual scanned. If any of you out there have original Centaur documents you are willing to scan and share, please email them and I'll keep adding to the library. April 9, 2007 - Got a great new resource on the site thanks to a generous fellow Centaur owner - the Clinton engine parts manual in .pdf format is now available on the Clinton Instructions/Warranty page - click here to go to the page. Also, the article on the Centaur came out this month in Antique Automobile magazine. I've been sorta slow on updates due to losing both home computers to a power spike. Happily, I was able to save my data, and am finally getting back up to the point where I can work on the websites again. Off to the big Charlotte Auto Fair this weekend - who knows? Maybe I will spot a Centaur! February 28, 2007 - Antique Automobile magazine sent me the galley proof for the article on the Centaur that is coming out in next month's issue today - looks great! The digital pictures I sent earlier got lost in cyberspace, but the editor was able to pull the Centaur ad off this web site web site and scanned a hard print I had sent in. He also pointed out I had written the HPOF out incorrectly - it is Historical Preservation of Original Features, not High Percentage of Original Features as I had in previous descriptions. (Don't bother looking - they are all corrected now). A pretty silly error, actually especially since the name is written out on the badge in the photo below! Oh, there have been two Centaurs on eBay in the past couple of weeks - one is there as I write this. You can see the details and photos from the listings on the Other Centaurs page. 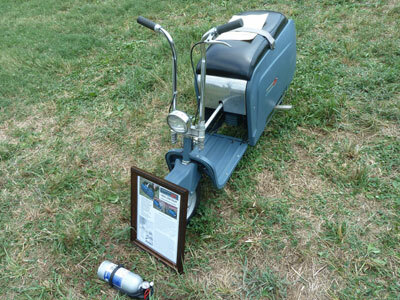 A complete, but moderately rough, one sold for $1300, not running. Are the Centaurs suddenly Chic? December 6, 2006 - NATIONAL AWARD!!! I got the letter from AACA today - while the Centaur wasn't specified, it said I have won a National Award, and since the Centaur is the only vehicle I have EVER had nominated, it's pretty easy to guess. I called Constance Foster and let her know - she was happy to know the scooter had gotten such recognition. So it's off to Philadelphia in February - I was going anyway to present a seminar on the Internet anyway, but it's nice to have a more selfish reason to make the trip! November 12, 2006 - I had to resurrect the old 35mm SLR to take pictures for the AACA National Award nominations - and I also had to clean the scooter up. That's usually the first thing I do to a vehicle when I get it, but the Centaur looked so nice when I got it I figured it was pretty much as good as it got. Wrong! Turns out some of the stains and what looked like bad plating in a few spots was just dirt and grease. I spent about an hour just scrubbing and polishing, and the Centaur spiffed up really well. 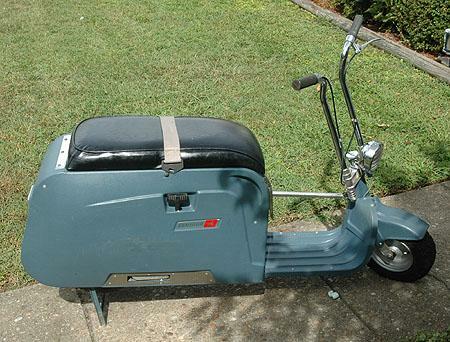 Except for a few scratches in the plastic side panels, the scooter looks almost brand new! November 1, 2006 - I hadn't realized the Centaur web page had been ignored so long - over a year since the last update! 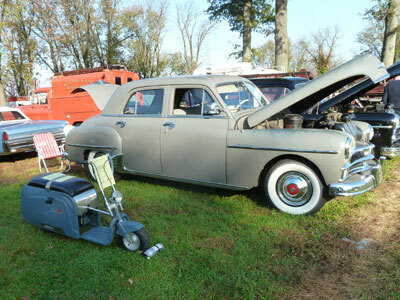 It lives in the trunk of the 1951 Studebaker and gets hauled out for shows. Amazingly she requires only opening of the gas shutoffs and fires right up every time! 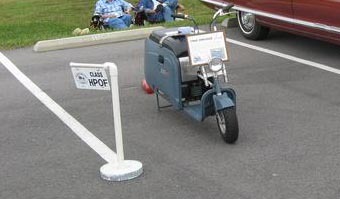 I displayed the scooter at a National Antique Automobile Association (AACA) Meet in May and got her certified for HPOF - Historical Preservation of Original Features. Not too hard, considering the only things changed in 42 years is the gas in the tank and air in the tires (which still have nubs on the TREAD!) However, this month I got two big surprises, both very nice. The widow of the man who designed and built the Centaur found the web page and sent me an email saying she liked the site! And she is willing to talk to me about the history of the scooter. 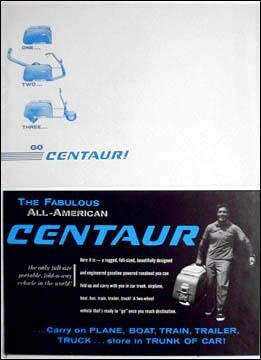 A bit of Centaur trivia - the designer is the man riding the scooter in the sales literature! Also, the AACA sent me a letter asking for photos of the Centaur - she has been selected as a candidate for a National Award! I have to send 4 3/4 view pictures using 35mm film. Good thing I still have a film camera hanging in the closet! October 28, 2005 - Make that 5 weeks until the next ride. I got the cast off yesterday, and took the Centaur out for a run around the block tonight. However, I was a bit better prepared this time - note the helmet on the seat. I also had on jeans and a jacket, as well as biking gloves. The scooter started up well despite sitting for more than a month, and rolled along fine. I did note that the brake cable needs adjusting - it has stretched out and doesn't engage until the handle is squeezed almost all the way. Oh, the license plate on the seat is the one it was first registered with in 1967. John, the original owner, sent it along with the owner's manual, Clinton engine warranty, and registration paperwork. I've been surprised by a flurry of eMail on the Centaur in the past month - at least three other people have written me after finding this web site. Maybe the price of gas is sparking interest in that 'weird old scooter stuck in Uncle Fred's wood shed.' Since there doesn't seem to be any other source of information on the web, I'll try to scan and post the operator's manual here, along with a short article that appeared in a 1961 Look magazine. September 24, 2005 - I had to go out of town for a week right after I got the scooter, and returned the afternoon before our local annual car show. This happened to be the club's 50th Anniversary, so in addition to my 1951 Studebaker, I decided to bring along the Centaur. 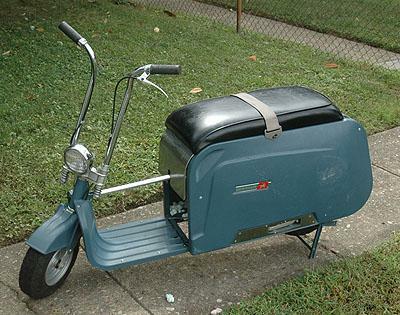 Folded up, the scooter fit nicely in the trunk of the Stude, with fuel safely sealed in the gas tank. I also made up a quick sign to explain what it was, along with a photo of it folded. The scooter proved to be a big hit, although my attempt to ride it from the car was foiled by a flat tire. The rear tube is leaking - something I need to work on. The 8-to-1 oil ratio for the 2-cycle engine also caused some smoking, not bad, but enough that the gals at Registration asked me to move along. I ended up running it, but walking beside as I rolled it to the display area. This caused no end of comments from friends watching, but the scooter still drew a crowd. The advertised claim of 100 mpg was of special interest to many, though most doubted the advertised 40 mpg top speed given its inability to move me at all. I got another crowd when I folded the Centaur up to pack back into the Studebaker. It's hard to picture all that stuff up front fitting under the seat, but if you position things just right, it slips together quite neatly! Why the picture of the cast? Well, when I got the scooter home I had to see what was wrong. Filling up the tire cured the scooter's reluctance, and I took it around the block. It was running perfect, better than ever. However, on the way to the house I discovered that those little tires don't let you corner too well. There's even a paragraph in the owner's manual about going very slowly in turns until you get used to operating the scooter. Maybe I should have paid attention - I ended up flipped sideways and doing a face-plant. Scraped face, arms, legs, and a wrist broken in two places. 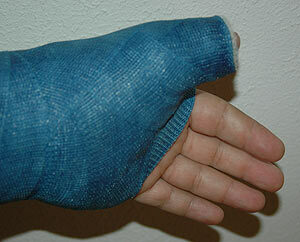 (Note the Centaur-colored cast). On the bright side, the scooter wasn't damaged - it didn't even stop running! I rode it back to the house and put it away before going to the emergency room. The next ride will be about a month from now. Wow! A herd of Centaurs! I started with the 'stripper' 1962 below, and just located the complete and original 1963 model shown above and to the right in Washington State. Or should I say, it located me. More info below. 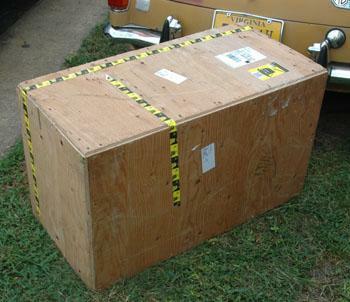 September 14, 2005 - The 1963 Centaur arrived today! I've been nervous about it, as the 41 year-old plastic side panels are irreplaceable (I found that out the hard way when I tried finding some for my 1962 Centaur). And more importantly, the idea of a machine sitting around for 41 years with pretty much zero use did not inspire confidence. Even so, I had a good feeling about the seller, and seeing as this is the first complete Centaur I have come across in more than a decade of looking, I wasn't about to pass it up. My fears of shipping disasters were unfounded - UPS did a wonderful job of packing. 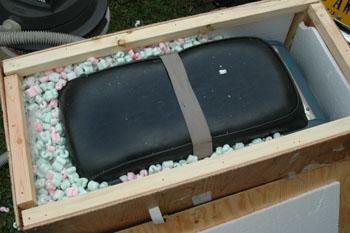 They built a solid wooden crate and lined it with Styrofoam panels and bubble wrap. (See photos below) Then they filled the empty space with Styrofoam peanuts which will be blowing around the neighborhood for the next week. I had to take the top and one end off - you don't just pluck a 90-lb. hunk of machinery up. At least, -I- don't. Once I got the packing brushed off, I was very pleasantly surprised. 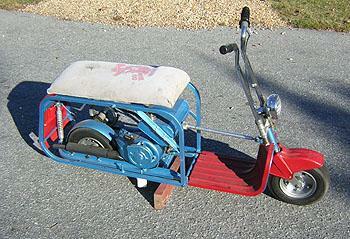 There are a few scratches and scrapes from four decades of storage, but overall, the scooter is in terrific shape. The tires still have the mold flashing in the center of the tread! It's one thing to be told a scooter has 1 mile of use on it, and another to actually see the evidence! However, the real surprise came when I put in some gas/oil mix and gave the starter rope a few yanks. Once I figured out that it had an on/off switch for the ignition, she fired right up and ran great! I flooded it out letting it idle while I pumped up the tires, but after a couple of minutes she fired right up again and I took her for her second 1-block spin since 1963. All the lights work fine, the brakes are good, and she ran better the longer I had her going. Then the muffler came loose - it's held on by one small nut and bolt, and they had vibrated off. A trip to the local hardware store took care of that problem, and the scooter is now ready to ride! Good timing, too - our big local car show is next weekend! September 4, 2005 - What's that?! A brand new Centaur? Or did I finally restore mine? OK, it's not brand new - it's a 1963 model - with maybe 1 mile on it! The owner bought it new to use with a small airplane that he never actually got. So the Centaur ended up in storage. It's been ridden around the block a few times since - the last time was in 2000. Anyway, the owner was poking around the Internet and found this site (Hi, Joe!). He kindly sent me a photocopy of the owner's manual and some photos of his Centaur. There is some scuffing from storage, but the scooter appears to be in really nice shape. And most importantly, complete! It should be on it's way here later this week! Yeah, I already have one - but mine is missing a lot of parts. Besides, with two of them, maybe they will breed! January 9, 2005 - OK - Two months is long-enough break. I finally checked out the Centaur again and removed the pull-start to take it to a shop. Except that when I got it off, I found out the part hadn't broken at all. Some lame-brain had installed the pull rope with too small a knot, and it had come through the stop hole. Oh. Wait a minute. -I- installed the pull rope. Anyway, I reinstalled the rope with a washer on the end to keep it from coming through again, and the pull-start seems to be fine. No gas in her and it is a bit cold out, so I didn't try to start her. But at least she SHOULD run again. November 3, 2004 - I replaced the pull rope with a new one last night, but did not try to start it. Got her going tonight, but she is still dying - may be trash in the fuel line. However, the pull starter broke inside again, this time something mechanical gave way. AAAUUGH! OK - time to take a break from this thing. November 1, 2004 - The pull starter rope popped out of the handle last time I tried to start the Centaur, so I pulled the cover and rethreaded it through the handle. Also the main pivot rod was missing the pushcap retainers, and kept slipping out, so I got some new ones tonight. It seems to have more pep tonight, but the engine started dying on me once it warmed up. Then the pull rope broke inside - I should have gone ahead and replaced it with a new one. Anyway, I have the wiring figured out, and should be able to get the headlight and engine kill switch working once I replace the starter rope. October 23, 2004 - It's alive! I was able to locate all the various hardware bits and cables today, and after some diddling with the fuel shutoffs and vents and the choke, she lit off. Still have to work out the idle, and fix the throttle to work better, but I rode the Centaur around the yard and was heading out on the street when the throttle cable pulled loose. I had not tightened the set screw enough. Anyway, it runs and drives! October 22, 2004 - I've spent a lot of time researching the Centaur this week - it is amazing how little actually exists on it. Other than the few ads I have seen before, I have identified two different sales folders and found photos of two others on the web. So far, I haven't found a parts source at all, though I was able to locate a twist throttle and some period handgrips that will do nicely. 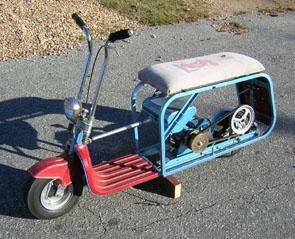 Happily, the scooter is complete with everything it needs to run other than the brake and throttle cables. I need to get some standard cable clips and a few screws, but that is just a matter of a trip tot he hardware store. 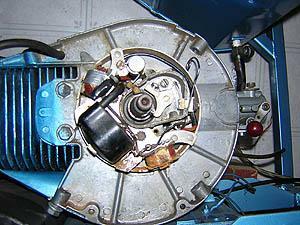 The fuel line from the gas tank to the carb is also hardened, but that is plain black rubber - another easy replacement. 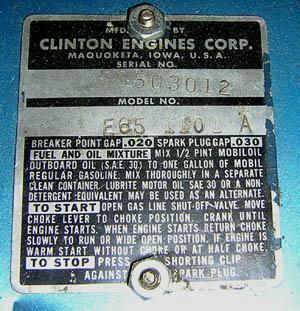 I found out something important tonight - the Clinton engine is a 2-cycle sealed bearing unit - the operating instructions are right on the engine. Note the 8-1 fuel mix - modern 2-cycle engines often run 50-1! As you can see, even the engine of the Centaur is like new. Jack Blair, a friend in the antique car club who did all the restoration work, bought the Centaur at a motorcycle and scooter show in Pennsylvania about four years ago. He cleaned it up and repainted it, but did not actually do anything to the engine. 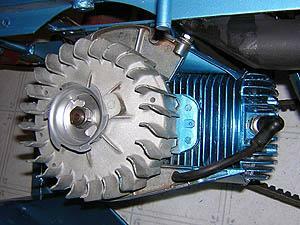 However, when I pulled the flywheel and the points cover, everything was in perfect order. The points, which Jack had not replaced, did not show any signs of wear at all! 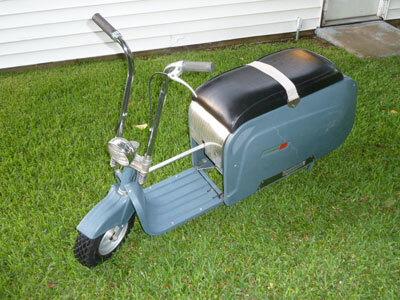 Given the unusual nature of the scooter, it is quite possible that it has only been run a couple of times in its 43-year life! I went ahead and cleaned up the magneto plates and wiped dust out of the flywheel, then bolted everything back up. I also cleaned and painted a correct Air Cleaner box that came with the scooter. 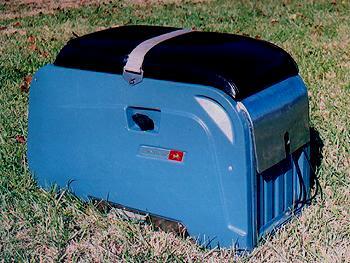 I need to get some new foam for the inside, but that can be had from any lawnmower supply shop. Tomorrow, I plan to get the fuel hose, cables, clamps, and assorted hardware - there is a good chance that the scooter will be running tomorrow night, or at least by Sunday. Of course, I am sometimes wildly optimistic. 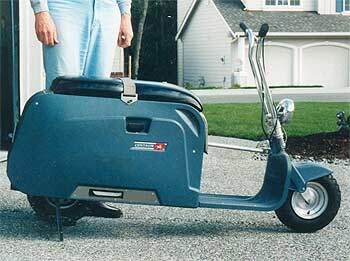 October 17, 2004 - Although I have never actually seen one before, I have been looking for a Lombard Industries Centaur folding motor scooter for about ten years. Designed for use by private pilots and boaters, this neat little unit will run 35mph using a Clinton engine, and folds up to a large suitcase-sized package that weighs about 50 lbs. 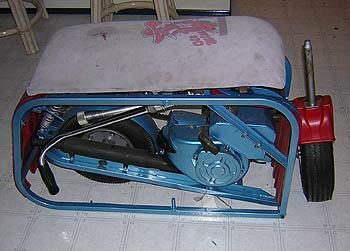 This particular scooter was in a friend's garage - he had bought it from another TRAACA club member, but decided he didn't want to mess with it. Given that I haven't ever seen one before, and the price was very reasonable, I bought it. The Centaur is missing the side panels, but almost everything else has already been restored. With some new cables and a bit of gas, she'll be useable as-is! More on it later.